Almost exactly one year ago, I wrote about MINI X (aka MINI XPlus H24, or MK805), an Android 2.3 media player powered by AllWinner A10 with 4GB flash and 512MB Flash, and it sold for $77.50. Today, I’ve come across an updated version, called MK805 II or MINI XPlus H34, with AllWinner A20 dual core SoC, 1GB RAM, 4GB Flash, and running Android 4.2.2. 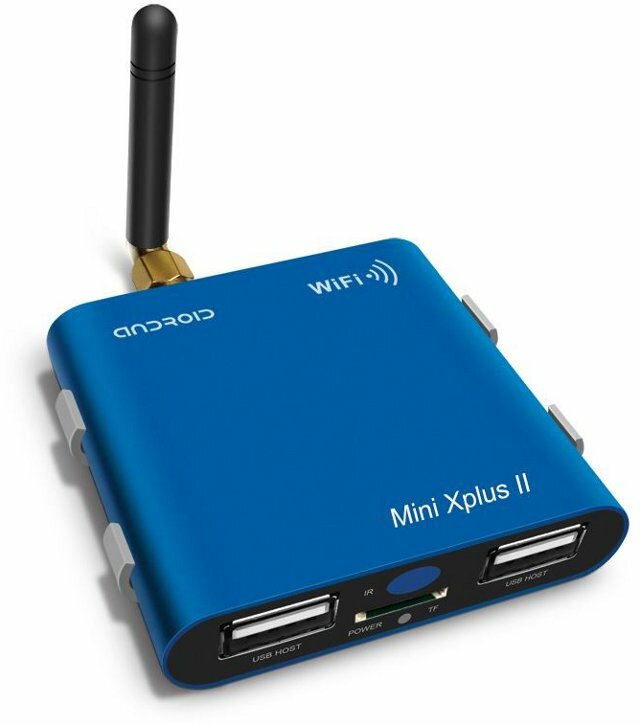 Connectivity – Built-in WiFi 802.11b/g/n, and firmware is said to support external USB Ethernet and 3G dongles. USB – 1x USB 2.0 Host and 1x full size USB OTG ports. The device comes with an HDMI cable (1.40m), an AV cable (1m), a Wi-Fi antenna, a 5V power adapter + cable, and a user’s manual in English. It might be interesting for those of you wanting composite output with dual core performance at low price. Even though there’s an IR sensor, this year model does not seem to include a remote control. MK805 II is available in Red and Black on DealExtreme for $59.80, and they apparently forgot to list the Blue version this time. The manufacturer is still Pineriver. Antutu v3.3 score of 3865 – see http://www.aliexpress.com/item/Mini-TV-box-MK805II-Android-4-2-2-RAM-1GB-ROM-4GB-Google-TV-WIFI-Smart/942438133.html (note: only 4GB NAND). What does an A10 score with that vn of antutu? I’ve got 4500 on single core Cortex A9 @ 800×480, so an AllWinner A10 tablet should be just under 4,000 at the same resolution. Antutu in MK805 II is at 720p resolution, so the score should be slightly lower, but not that low. Around 2600 – http://tabletrepublic.com/forum/android-mini-pc/mini-pc-benchmark-comparison-2537.html – I haven’t got around to updating the community database Mini PC comparison table (http://socialcompare.com/en/w/usb-stick-dongle-mini-computer) with this info, however if anyone wants to, or has better or more comprehensive data, please go ahead 😉 (see http://www.cnx-software.com/2013/04/28/collaborative-comparison-table-for-hdmi-tv-dongles/ and http://liliputing.com/2013/04/want-to-help-create-a-database-of-android-tv-sticks.html or front page http://liliputing.com/ right-hand column). I am heading for the Jesurun A19 with identical specs -and a lot more, though no external antenna. Eddy Lab gets Antutu score of 4266 points (http://muritzy.tistory.com/686) when testing the A20 Media Stick – Dual Core Allwinner A20 1GB RAM 4GB Flash (http://www.cloudsto.com/android-mini-pc-s/a20-media-stick-dual-core-allwinner-a20-1gb-ram-4gb-flash-detail.html).